If you need to have your documents legalized to send to your country, we can notarize, get an Apostille and Fedex/UPS to your embassy, consulate or country. Call us today. 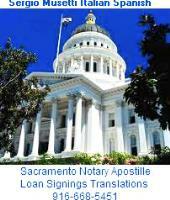 It is common for notarized documents which will be sent to other countries to also require an Apostille. Apostille is a French word, which means a certification.The word is commonly used in English referring to the legalization of a document for international use under the terms of the 1961 Hague Convention Abolishing the Requirement of Legalization for Foreign Public Documents. Documents which have been notarized by a notary public, and then certified with a conformant Apostille are accepted for legal use in all the nations that have signed the Hague Convention. Other documents, such as marriage, birth and death certificates, and academic diplomas from public institutions do not need to be notarized to get an Apostille. In the United States, Apostilles are issued by the Secretary of State. Refinance, purchase loans, HELOC, etc. Certified Signing Agent with National Notary Association since 2003, closing for title companies, mortgage brokers, loan officers, escrow officers, Real Estate agents, attorneys, lenders, banks, public. Call today and have your apostille done in a week or less.